Having a foundation for your shed is always a good idea. It ensures your outbuilding is well supported, level, and not in direct contact with the ground, prolonging the life of your shed. If you’re wondering how to build a pier shed foundation, or if it’s a project you can do, you’ll be happy to know that it isn’t as complicated as it seems. To build a pier shed foundation you’ll need to determine the right number of piers, mark the pier locations, dig or drill the holes, place the sonotubes, and fill them with concrete. The last step is to add bent anchor bolts or galvanized post base before the concrete sets. I built a concrete pier foundation for my deck, and since the overall process is the same for building a foundation for a shed, I’ll use it as an example. Here’s everything you need to know to build a pier shed foundation. What is a Concrete Pier Foundation? How Much Does a Concrete Pier Foundation Cost? A concrete pier foundation features a series of concrete piers sunk below the frost line and supporting treated wood posts above the ground. The shed is then attached to the wood posts, usually with steel connecting plates or post brackets. Typically, most sheds will need four posts, located near, but not necessarily at, each corner of the building. Larger buildings may require more, depending on the span and the amount of weight to support. A pier shed foundation elevates the shed, keeping it from direct contact with the ground. Since the concrete piers extend above the soil, it is an excellent choice if your terrain is uneven or if water tends to collect in the area. It creates a level foundation for your shed and prevents the moisture from contacting the wood floor or underlying supports. Since a concrete pier foundation requires you to dig below the frost line, you need to examine your yard before selecting this option. If your ground is rocky, digging deep enough may be physically challenging. In contrast, if the soil is too soft, it may not provide the piers with enough support, allowing them to sink. Additionally, if the frost line is deep, you’re going to need to go deeper. For example: in parts of Michigan, the frost line can be 40 inches deep, and in Anchorage, Alaska, the frost line can be 60 inches down. Considering you need to dig 6 inches deeper than the frost line, that’s a deep hole! When you’re planning your pier foundation, two factors play a significant role. First, the size of the shed will determine the location and number of concrete posts. Second, the amount of weight you plan to store dictates the diameter of the piers. Heavier objects mean you need more support, so a shed holding items like a riding lawn mower will need bigger piers than one holding basic garden tools. The shed’s structure can also be a factor. The size of the joists determines their strength, dictating how many piers you’ll need. Larger joists can carry more weight across longer spans. So if you want to limit the number of piers, increase the size of the joists. It’s better to have more piers instead of too few. Your structure may have more support than it requires, but that’s not a bad thing! In fact, it can prevent the floor from bouncing and may allow you to store more weight inside your shed without damaging the structure. Before you begin digging, you need a foundation plan based on the dimensions of your shed. This will help you determine the number of piers and their locations. An 8 ft x 12 ft shed will need 6 piers, 3 per long side. Typically, the span between two piers is based on the dimensions of the beams and the joists. A double 2×8 beam should be supported every 4 to 6 feet. A 2×8 joist can normally span 8 feet. Additionally, you want to place the piers near the corners of the structure. You can recess the piers slightly from the corners of your shed, though typically no more than about 2 inches in from the end of the beam. You’ll also need to determine what materials you’ll require, including the amount of concrete and size of the pier forms. This varies depending on the size of your shed and the piers, so you’ll need to calculate this for your specific project. While you may be excited to get started, don’t rush into the project. Preparing your site for a pier shed foundation is a multistep process, and failing to prepare properly can have consequences. Before you begin any work on your concrete pier foundation, you need to determine if you need a permit. Building permit rules vary by state and even municipality, so check with your local building authority. Typically, you can find details about what does or does not require a permit online. However, you can also call your city or county if you cannot locate the details you need or have questions that aren’t answered on the site. You’ll need to determine the depth of the frost line. In many cases, your local building authority has this information (and often uses it to guide local requirements). You can also check state resources, such as your local Department of Natural Resources or a similar agency, for details about the frost line. If you live in an area where the frost line is shallow, you should still dig at least 48 inches deep. This ensures you have solid support under your shed, creating a stable structure. Figuring out where your shed is going to go is a crucial step. You don’t just want to start digging randomly or think that you can toss your shed just anywhere. Begin by examining how water moves and collects in your yard. Also, determine whether the soil is suitable for a pier shed foundation before you commit to a location. The location of the piers is largely dictated by the size of your shed. The supports need to be in the right locations. Otherwise, the floor of your shed could sag, warp, crack, or even break. The easiest way to determine the size of shed you need is to consider what you want to store in your shed. If you only need a small assortment of gardening tools and a regular push mower to fit, then a small shed might do the job. However, if you plan to store a riding lawn mower, you need to take its size into account. Before you start, it’s best to gather your tools and organize your materials. This ensures everything is readily available whenever you need it. For example, gather all of your concrete tube forms and place them in one location; preferably not in contact with soil. Moisture from grass can seep into the tubes and damaging them. Create an area for all of your tools and lay them out in advance. That way, everything is on hand before you begin, so you won’t be left scrambling. Your first step for marking the pier locations is to outline the perimeter of your shed. Use stakes to mark each corner and attach strings to each stake to create the outline. Regularly check to make sure your corners are square. Otherwise, your piers may end up in the wrong place. Create a grid to help locate where the piers will go. The recommended distance is no more than 4 feet on center if you want a very rigid base for your shed. However, if the length or width of your shed doesn’t evenly divide by four, you’ll need to make some adjustments. For example, with a 10 ft. x 12 ft. shed, 12 ft does divide evenly by 4. However, 10 ft. does not. You’ll need to make the spans between the piers along the 10 ft length shorter than 4 feet (in this case, 40 inches on center) to ensure you create enough piers. Joists that span 8 feet are acceptable but may experience some bounce. As you find each intersection on the grid, use marking paint to mark it. This shows you where you need to place the piers. You have a few options for digging the holes for the concrete piers. First, the manual method. Simply use a post hole digger to reach the right width and depth. It’s labor intensive but will do the job. Alternatively, you can rent a two-man hole digger or a towable hydraulic auger. This increases the cost of your project but lowers the amount of time and labor for the project. You want to make sure your holes are approximately 2 inches larger in diameter than your form tubes. This gives you room to adjust them. Additionally, flare the bottom slightly. This creates a larger base, adding stability. Make sure the holes are round, not square. The concrete forms will be round in most cases, so you want to surrounding dirt to support them. Add 4 to 6 inches of gravel to the bottom of the hole and tamp it down. This creates a firm foundation for the pier itself. Concrete form tubes, also known as sonotubes, serve as the form for your concrete. Often, you can find them available in standard sizes, like 12” x 48”. If you need something other than the standard, buy longer ones and cut them to size. Keep in mind that, once placed in the holes, the sonotubes need to reach approximately 6 inches above grade, so make sure you don’t cut them too short. This puts the top of the concrete above surface water and keeps the wooden post dryer. Once they are the proper length, place the sonotubes in the holes, making sure they reach the gravel base. After placing them in the ground, you need to make sure everything is level both vertically and horizontally. This can be a somewhat time-consuming task but is necessary to create a level foundation. Level each sonotube, making sure it is fully upright and that the top is level. You may need to adjust the holes a bit as you proceed, giving you the ability to shift the tube. After each sonotube is level and properly aligned, backfill the extra space surrounding the tube. Then, tamp it down for additional stability and to prevent settling. This ensures it doesn’t shift while you pour in the concrete. Whether the sonotubes are level to each other is less relevant, though they should be close. Once the wooden posts are attached, you can make adjustments during the shed installation phase by cutting the treated posts to the proper length to create a level surface. If the soil is soft and deep, you may want to use plastic wide bottom pier forms for greater stability. They need a larger hole or excavation for the base to be below the frost line. Once in the hole and leveled, backfill and tamp around the form. The rest of the process is the same as with the sonotubes. Try to get the forms as level as possible with each other. Often, the easiest way to check is with a straight piece of wood, like a 2 x 4, and a construction level. Place the board between two sonotubes, starting in the corner and moving along an edge. Put the level on the wood and see if they are level. Repeat the process with each subsequent tube, leaving the level ones in place and only adjusting the new one you encounter. Once your sonotubes are straight, you can begin mixing your concrete. Follow the manufacturer’s instructions to determine the proper water to mix ratio, and how it should be stirred. When the concrete is ready, you can prepare to pour. Work slowly to ensure that air doesn’t get trapped as you add the concrete. Trapped air can cause the concrete to crack and the pier to fail. Once you reach the top of the form, insert two ½” x 48” rebar into the pier. The rebar has texture so it can drag air into the mix. If you move slowly, this is less likely to happen. After the rebar is sunk, smooth the top of the concrete level. Finally, place a 4” x 4” or 6”x6” galvanized post base into the top of the concrete before it sets. Make sure the post base aligns with the beam or joist plan. It should sit on top of the concrete and be level. If the base isn’t level, the treated wood supports will lean, creating a less stable base. Alternatively, you can insert bent anchor bolts instead of post bases. Repeat the process for every pier. Take your time to make sure everything is done properly, is level, and ensure air bubbles won’t be an issue. If you moist cure the concrete for seven days, it will create a pier that is around 50 percent stronger than unmoist concrete. Leave the form in place and spray down the area with water. Place a plastic shield, like a tarp, over the posts, and pin it down with cement blocks or timber. Just make sure that the plastic doesn’t contract the top of the concrete. If necessary, use stakes to hold the tarp up, creating approximately a 1-inch gap between the top of the form and the plastic. You’ll need to rewet the area over the course of a full week. This can be done with a hand sprayer or a sprinkler. But the plastic helps prevent evaporation, making the task less tedious. After the concrete has set, your pier shed foundation is complete. You’ll just need to add the posts and attach the shed, which will now be set on a sturdy foundation. The total cost of a pier shed foundation varies depending on the size of your shed and the depth of the piers. A standard 12” x 48” sonotube will cost about $14 each, depending on where you shop. Each piece of rebar is an additional $4, and a 50 lb. bag of gravel should cost approximately $5. Post bases cost about $12 each. For each pier 12” x 48” pier, you’ll need just shy of five 80 lb. bags of concrete. Typically, each bag runs about $5, so you’re looking at about $25 per pier. To give you an idea of the total, if you are constructing a 10 ft. x 12 ft. shed, and are creating 16 piers, that will cost approximately $1,000. However, the actual cost will vary if your piers need to be deeper or if you chose not to place the piers based on 4-foot spans. If you choose to rent equipment, such as an auger or cement mixer, your total cost will rise. Rental prices vary by location, so you’ll need to check local suppliers for those estimates. Additionally, this only creates the concrete pier foundation. Treated wood posts and the shed itself are other expenses you’ll need to factor in to bring your project to completion. While creating a pier shed foundation is a large undertaking, it does prolong the life of your shed. 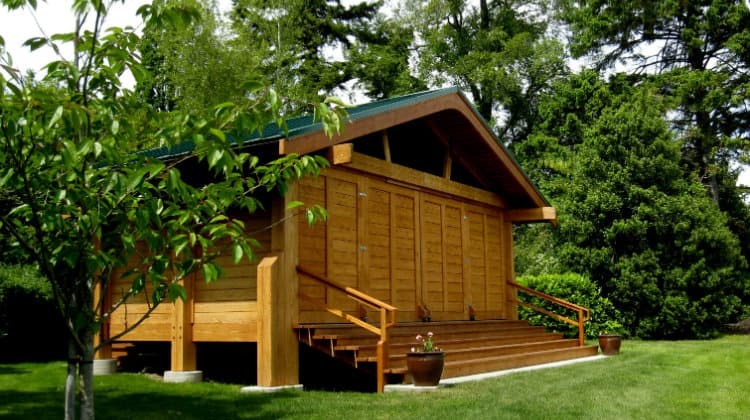 Your outbuilding won’t contact the ground and will be more stable, making it worth the effort. Creating a concrete pier foundation takes time and patience (especially as the concrete cures). But, a well-made foundation can last decades, so one hard day’s work and a little waiting reaps real dividends. If you’d like to let me know what you think of this pier shed foundation guide, please leave a comment below. And, if you enjoyed the article, feel free to share it.